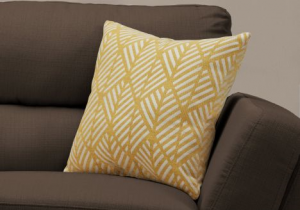 Transform the look in a room with this chic square accent pillow in a modern geometric design. The bold criss-cross stripes in yellow and white add a contemporary flair to your favorite chair, sofa, bed, or entryway bench. The woven design on both sides is on a soft polyester fabric, and the convenient side zipper allows for easy removal of the poly fill insert to machine wash the pillow cover. This versatile throw pillow will instantly give a vibrant boost to your decor!